On average, car crashes kill an American pedestrian every 2 hours and injure one every 7 minutes, according to statistics from the CDC. A new study suggests changing road signs to depict more motion—a pedestrian running instead of walking—may be one simple way to help prevent potentially dangerous accidents. Across five studies, University of Michigan psychological scientist Luca Cian—along with co-authors Aradhna Krishna and Ryan Elder—found that signs that depicted motion resulted in faster reaction times and increased vigilance among would-be drivers, which could ultimately lead to faster stopping times. Previous research has shown that the same brain regions are active when observing action and when imagining motion, even when viewing static images in which motion is merely implied. This suggests that even in the absence of actual motion the brain is perceiving, and even anticipating, movement. In one experiment, Cian and colleagues used eye-tracking technology to measure the time it took for a person to notice a traffic sign. Fifty college students were fitted with an eye-tracker and told they would be evaluating landscape pictures on a screen as if they were driving on a road trip. Participants were randomly assigned to see only high-motion traffic signs (a rock in mid-air as it falls off a cliff), or traffic signs with static images (a rock sitting on top of a cliff). The eye-tracking results showed that participants’ eyes focused on the sign sooner, and scanned areas around the sign more thoroughly, when the signs depicted movement. In a second study, 275 students watched a video simulation of driving on a screen. Participant “drivers” were instructed to press different keys on a keyboard in response to “warning signs” (indicating drivers may have to take action) and “informative signs” (e.g., indicating gas or hotels up ahead) that appeared along the side of the road. Half of the participants saw only high-motion traffic signs, while the other half saw only signs containing static figures. Again, participants had significantly faster reaction times in response to the high-motion warning signs. For a car going 60 mph, that 50 milliseconds of extra time translates into an additional 4.4 feet of distance—which can make the difference between a tragic accident and a close shave. A final study demonstrated that these more dynamic signs may actually cause drivers to stop earlier. 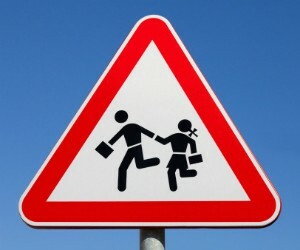 In an online study, 114 participants were shown a traffic sign indicating children playing. Participants were asked to move a picture of a small car to the location of the road where they would hypothetically start to slow down their vehicle in response to the traffic sign. Those who responded to high-motion signs indicated that they would slow down significantly sooner than those responding to the static sign. “Since variations in traffic iconography systematically resulted in safer behavior, this research could impact accident-related injuries and even mortality rates from traffic accidents. Secondary effects would be seen with reductions in automobile repair expenses, as well as car insurance health care costs,” the researchers write in the Journal of Consumer Research. And the results of this study have implications that could go beyond road safety—increasing dynamism of images in other areas, such as recycling icons or consumption cues for health foods, may also have a beneficial effect on people’s behavior.